Imagine recruiting the brightest and best veterans of Gallipoli or the Somme, the British suffragettes and the Australian suffragists, the players in the famous Tied Test, the astronauts from the Apollo Moon missions, the best old blues singers of the 1930s, or survivors from any other remarkable historical event for that matter. Then bring them from across the world to a studio and put them on stage with an equal number of hand-picked descendants of those veterans, suffragettes, cricketers, astronauts or singers, and let the event begin in front of an audience. One by one, the fragile, reedy voices of those ancient, scarred and illustrious figures begin to speak, to tell us what it was really like to have gone through those extraordinary events in the world, or in space, at that time. But before their story is even partly delivered, the microphone passes to the descendants, who explain, in their own way, what this encounter with their own past means to them at a personal level. Those stories are fascinating enough, and the audience soon shifts its expectations. Before long, the sight of another ancient and illustrious survivor from those past adventures represents simply a new opportunity to learn about the descendants’ contemporary lives and feelings. One has the distinct sense, in fact, that the survivors are there principally to introduce their descendants. Is this an unfair way to characterise the National Museum of Australia’s Encounters exhibition? Perhaps a little, but then it is difficult to judge how ethnographic museums should be presenting their wares in these times and, indeed, to whom they should be directing their offerings and conclusions. What is clear enough though, is that we have entered a new phase in the history of these museums, whose combined collections of Australian Aboriginal artefacts number more than 200,000 objects within this country, and perhaps a total of another 50,000 objects in overseas museums, at a conservative estimate. 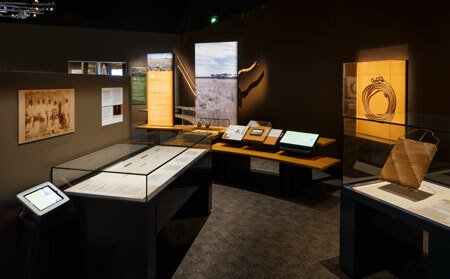 The great majority of that quarter of a million artefacts cannot be described as artworks; in fact, most are weapons and tools made and used by Aboriginal men and women to sustain a hunter–gatherer existence, and to regulate the social boundaries and tensions of that existence through various forms of conflict. The great majority of those objects date to a period before the 1980s, when the Western Desert art movement became the catalyst for new ways of regarding museum collections. Ahistorical texts and captions had been standard fare, rarely mentioning the circumstances of collection or the identity of makers and artists. Objects were jigsaw pieces in the puzzle constructed and solved for the public by curators, with little need for an Indigenous voice. That has all changed. 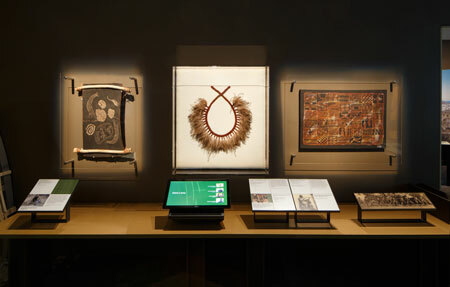 There could be no clearer demonstration of that shift than the National Museum’s Encounters, with its lively abundance of Indigenous voices discussing and enthusing over the rich haul of long-lost objects retrieved for this exhibition from the British Museum’s stores. Even so, I felt a twinge of regret for that style of exhibition in which ancient, resonant objects could work their magic in space and silence, drawing the viewer into a direct dialogue, assisted by informed and insightful captions. Despite their patronising tone, and even their faulty interpretations, the best of those exhibitions allowed those objects to subvert and overturn the ordinary preconceptions and stereotypes of primitivism, authenticity, extinction and social evolutionary profiling which many visitors brought into the museum as their standard baggage. Today’s museum visitors bring a different set of assumptions, in which notions of the Dreaming combine somehow with a suite of ideas and issues relating to the Stolen Generations, social justice and disadvantage, reconciliation and survival. These are all issues for which museums are well-primed to rehearse and explore – so much so, in fact, that the idea of exhibiting objects from an earlier period, when few of those issues were prominent in the minds of collectors and anthropologists, represents a real challenge. How to present those scarred and battered old relics of another time without the very latest in interpretive context? Could those unpredictable old objects be trusted on their own, or would they require contemporary chaperones to frame these objects in their correct context and to do most of the talking? We can imagine that some form of this discussion, with sufficient heat and light, took place as the British Museum and the National Museum of Australia began forming their curatorial ideas about the major survey exhibitions to be held in London and Canberra, respectively titled Indigenous Australia: Enduring Civilisation and Encounters: Revealing Stories of Aboriginal and Torres Strait Islander Objects from the British Museum. Both exhibitions made it clear that if ethnographic objects were once accepted as fixed reference points for defining Aboriginal culture, in terms of adherence to tradition and authentic practice, museums and their curators now see these objects quite differently. Objects are manifestations of evolving cultural practice, despite the ruptures of colonialism. An ancient shield may be extraordinarily beautiful but it is no more ‘authentic’ than contemporary forms made primarily for museum display. ‘Fitness for purpose’ may still be a criterion, but purposes have been redefined, and fitness is no longer defined by curators alone. 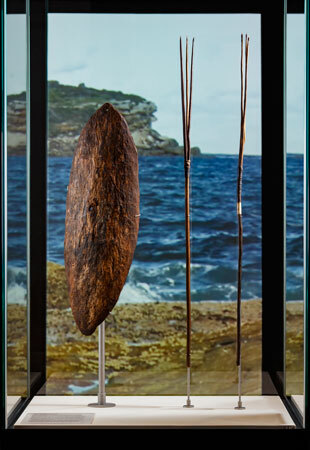 And so a fishing rod used in Sydney Harbour by an Eora descendant finds its place in the National Museum’s exhibition alongside a pre-1820s fishing spear, and a glossily varnished, rather chunky ‘marriage stick’ accompanies a more disreputable , if finer example from the 1840s. The original term ‘marriage stick’ may have been ambiguously or loosely applied by the 1840s collector, but the curatorial process of open-ended and non-judgemental consultation has inspired and validated the creation of a new object, and possibly even a new ritual. At these moments one might hope for even a slight hint that the curators understood that their enlistment of early 19th-century objects as cultural aides-mémoires might lead to such results. The curators have taken an understandably low profile in this exhibition. If the result is a pervasive moral earnestness which sometimes overreaches itself, the corrective is applied by the descendants’ own straightforward testimony about their relationship with the objects in the exhibition – whether from the British Museum, the National Museum’s own collection or from their own hands. This is so whether the subject is an 1870s dulloom or woven bag collected from Bundjalung people of the Richmond River by Mary Bundock, or a 1950s pokerwork shield made at La Perouse. The woven bag would have qualified for any exhibition selected on ethnographic criteria, and this point could not have been made better by the Bundjalung elder, Lauren Jarrett: ‘You really feel like you’re holding your past. It really has such an ancient energy’. With its derivative form and figurative, Europeanised imagery, the La Perouse shield might not have passed muster in bygone museum exhibitions, but the testimony of Shayne Williams, Dharawal elder, renders that museological benchmark irrelevant in a disarmingly simple way. ‘You can see’, he says, referring to the shield, ‘they took great pride in their work. They didn’t rush. These are handmade and the imagery is significant, like the burrawang [cycad palm etched on the surface] is significant to me and my mother and my country’. Perhaps the significance of this exhibition lies in the honest and extraordinary effort made by the curatorial team, led by Ian Coates and Jay Arthur, to ensure that these particular, often idiosyncratic, contemporary perspectives – especially on the British Museum objects, were captured sensitively, and intelligently relayed to a broader public. 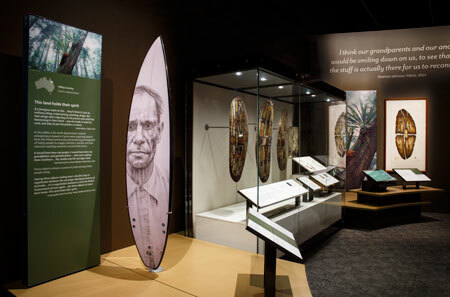 There is no doubt that visitors to this exhibition emerge with a fuller understanding of how objects from the past may crystallise and render tangible a heritage that must often seem elusive and ungraspable by descendants living in ‘settled Australia’. If the contemporary voices often appear to overwhelm the delicate, fragile voices of the ancient objects, it is worth noting that the sense of pride in those contemporary voices, and their almost unanimous endorsement of the project. This very shield, ovoid, seemingly unpainted, with its handle carved in the round and with the hole described by Banks, is now preserved in the collections of the British Museum. It is the earliest surviving shield collected by Europeans in Australia. It was featured in the British Museum exhibition and is now the centrepiece of the National Museum’s exhibition. Here in Canberrra, it is given its own installation-case, in front of a specially designed screen showing waves breaking on the shore – presumably evoking that day in August 1770 when it was collected. The caption for the shield contains the suggestion that the hole in the shield was caused by a bullet from a British gun. The diameter of the hole in the shield matches that of spears used by Eora men of the Sydney region, in the British museum’s own collections. The viewers deserve to have access to this information, for apart from anything else, the Banks shield is the earliest object of encounter between Aboriginal people and Europeans to have been described and preserved. And, as Shayne Williams puts it in the exhibition, the place from where it was picked up and from where it began its ‘long journey’ to the British Museum, was also ‘where the rest of Australia was annexed to the British. Aboriginal dispossession started there, in that very place’. The ‘long journey’ is the title given to the texts in the exhibition that describe the original collection and subsequent history of the British Museum objects. As a curatorial device it is quite neat, and the information relayed through this paragraph or two provides vital data as to how those objects came to be collected in the first instance, and subsequently acquired by the British Museum. But these texts are often rather inconsequential and trivial in nature, particularly when one is more curious about the actual role and context of the objects, as they were made and used in an Aboriginal society that is now as remote to us as it could ever be. What is the actual stitch or weave that makes the Bundjalung bag so compelling?. How were holes drilled in the bean-tree seed necklace that is attributed to the Dieri (but which probably arrived in Dieri country from the Hermannsburg mission)? Could there have been a bagu fire-making kit displayed next to the recent pottery models of these kits, in order to make sense of this element of the display? Why not mention the red-ochre colouring on the emu-feather dance ornament collected in Noongar country in 1838, and even speculate on the source of that ochre as an indicator of the trade networks that bound Aboriginal Australia together, across language groups? That is where we feel the lack of a unifying curatorial voice. The visitor might also want to know more about the extent and history of the British Museum collections, and how that collection reflects the total holdings of Aboriginal objects in Britain, or overseas more generally. What collections or sections of Australia were overlooked in order to create this exhibition? Was there a reason for omitting all Central Australian material, for example, such as the large Spencer and Gillen collection of Arrernte, Kaytej, Warumungu and other objects? The back-story of this exhibition, like all the major exhibitions on any subject, would make compelling reading. It is a testament to the sheer power and beauty of the early objects in this rich and varied exhibition that their voices are heard ringing softly through the hubbub and through the daunting array of expensive exhibition furniture. One can only imagine the complexity, heat and vigour of the curatorial discussions which led to the eventual presentation and to the distillation of what is, in spite of its many voices, a coherent display. The National Museum’s exhibition was not rattled together in a few months. It took several years, a great deal of money, and a team of curators who faced the challenge of creating a smooth narrative from all the disjunctions and anomalies which such a venerable collection contains. This strong, provocative exhibition comes with an excellent fully illustrated catalogue, full of quotations from the descendants and a series of essays underlining the importance of heritage and history discovered through objects and the questions they provoke. 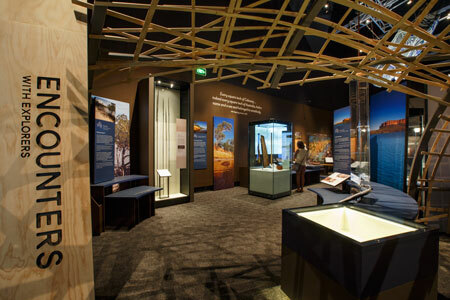 Philip Jones is a senior curator in anthropology at the South Australian Museum, where he curates exhibitions based on material culture and the ideas generated by collections.